You will love this easily accessible, meticulously maintained Kihei Kai Nani condo. Consider: new kitchen, updated bath with walk-in shower and sparkling accessories. King-size bed that is firm and comfortable. Our condo is fully-equipped with everything you need to enjoy a fantastic Maui vacation. The Wi-Fi signal is strong throughout the unit and allows easy connection to the Net. 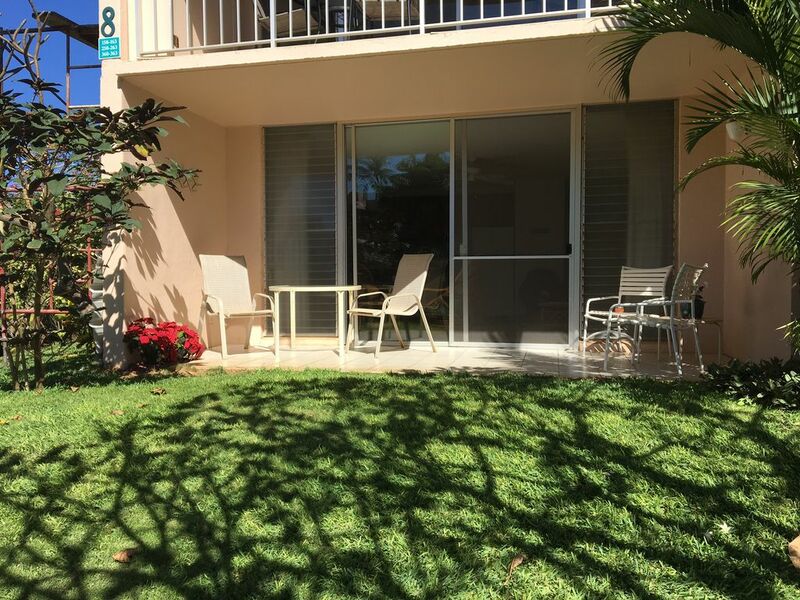 We love the fact that as a ground floor unit, our lanai opens onto a green lawn that allows us and our guests to spread out on the grass and enjoy the sun. The lanai and lawn are an "extra room" in our Maui home. Most important, we have maintained our condo in exceptional condition. It is cleaned carefully after each guest's stay and receives a deep cleaning at least twice each year. Only one minute's walk down the driveway, we love the Kamaole 2 Beach Park. The beach and water are spectacularly clean and make for great swimming. At Kam 3, only minutes further on, the snorkeling is excellent. It is common to watch sea turtles within feet of the shore as they feed on the seaweed near the point. Kihei Kai Nani itself is so convenient. Parking is plentiful, free, and convenient to the condo. The large freshwater pool is open all day and into the evening for guests. Shops and restaurants are close at hand, including a well-stocked natural foods grocery and exceptional cinnamon roll bakery. We have tried in all ways to create the Maui home that we love to visit when we use the condo ourselves. We hope you will enjoy it as much as we do! We love Maui! For more than twenty years, my wife Merrie and I have enjoyed the wonderful air and beautiful beaches of Kihei. Since we met on Oahu in the '50s, we have considered Hawaii and Maui specifically our second home. I am retired and spend my time supporting my family and Merrie in her many projects helping people in our town. In my spare time, I often play the ukelele and have recorded over 50 songs -- many about the beauty and the life on Maui. I would love to have a chance to share my music with you! We first visited Kihei Kai Nani more than twenty years ago. It was so lovely, so relaxing. The next year we returned and decided to invest in a little piece of Paradise ourselves. We think you will love our condo. It is bright, clean, and fresh. As an end-unit in our building, its extra windows bring in wonderful light and soft Hawaiian air. It makes a fantastic place to relax and enjoy oneself any time of day -- but especially after a great day at the beach! Wild and colorful birds visit us each morning while we breakfast on the lanai with fresh papaya, lime juice, toast and coffee. At night we can hear the ocean. The condo has everything to enjoy the beach: beach chairs, mats, beach towels, and more. Restaurants and shops are close by. We often enjoy stopping for drinks in the evening at the larger hotels, and it is easy to take in performances at the Maui Arts & Cultural Center in Kahalui. Our bathroom is newly updated with walk-in shower and new vanity. Clean and fresh. Mainland, Hawaii, Canada, Mexico without charge. Parking is free and easily available directly in front of the condo. Our condo has a strong wifi signal throughout the unit, available to guests via password. We try to keep a good selection of titles in the condo. There is also a selection of free reads available in the office. Our lanai opens onto a wonderful green lawn that allows you to spread out into the fresh air. A fantastic place to relax after returning from the beach. Sunny and warm. Easy check-in, readily available parking. The apartment is clean, if a little dated. Reasonably quiet, but the birds do get going around sunrise. Very convenient for everything in Kihei: shops, beaches, restaurants, etc. Excellent location with friendly office staff and beautiful beach right across the street. The unit is also thoroughly equipped with beach items, towels, and kitchen utensils, etc. The owner was also very responsive with communication regarding payment and unit access BEFORE our visit. I would have given this property 5 stars had our unit been clean and had the owner responded to our call and text message of concern upon check-in. I took pictures of the bathroom (hair in sink, on floor, and around toilet) and bedding (hair on pillowcases and in the bed) and texted them to the owner to request a response but had no reply. I also followed up by phone with no reply. A five star unit is easily attainable by the owner— hire a new cleaning crew who actually ensure the unit and bedding are clean and in circumstances where a renter has a concern, BE responsive. It doesn’t reflect positively on the owner when you have excellent communication during payment communication before your rental date and nothing after. It would also have been a nice gesture by the owner to provide an additional refund to us for the cleaning and bedding laundry WE had to do to make the unit comfortable and hygienic. Awesome time at your place! Fully equipped with everything. Great location. Caught the sunset across the street. Wonderful eating places nearby. This is a fabulous location, across the street from a great beach, close to Big Beach and restaurants right next door. The condo is well stocked, the kitchen, beach towels, beach chairs and a beach umbrella. Great pool as well. Couldn’t ask for a better stay!!! We could not have asked for a better location for our 50th Anniversary Island celebration. We have previously used this Kihei condo and would do so again and again. It is conveniently located across from a great beach, there is also a pool conveniently on the property, and plenty of restaurants within walking distance if you prefer to eat out . The condo itself is comfortable and has everything you need for whatever length your stay may be. Cannot wait to plan our next visit. The condo was wonderful . so glad that there was a box fan there . everything was great ! Great location. Very nice condo to stay in! We are located in Building 8 of Kihei Kai Nani, a comfortable and convenient condo complex in relaxed South Kihei. From our lanai, the fantastic swimming at Kamaole Two Beach Park is no more than two minutes' walk away. Snorkeling is excellent. Restaurants and shops are close at hand, including The Cinnamon Roll Place, where one can pick up fabulous macadamia nut encrusted cinnamon rolls any morning of the week and walk home to enjoy them with the morning coffee. All of Maui is easily available from this location. Parking is free immediately in front of the condo, and we enjoy a strong wifi signal throughout the unit. Make this your home base for a visit to Maui! A $250 damage deposit will be charged upon booking. This deposit will be automatically refunded IN FULL within 7 days of checkout, if no excessive damage has occurred during a guest's stay.